Based in County Roscommon, holistic therapist Marian Trench has been expertly trained in all aspects of this Reiki and Bio Energy therapies. She also holds a diploma in Anatomy and Physiology. Marian holds healing clinics in Roscommon throughout the year. She is passionate about people and their journey of discovery to healing & wholeness within themselves and thus their own lives. 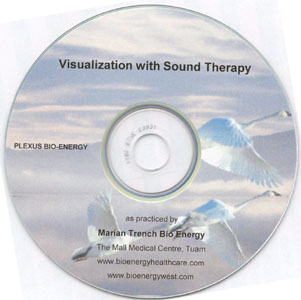 Bioenergy Healing practitioner Marian Trench has been expertly trained by the Plexus Institute. Marian's treatments do not involve any physical contact with the patient. During Bioenergy Healing treatment Marian will explain much more to you including any immediate measures to be taken particularly with regard to your diet, exercise, rest and positive attitude amongst other aspects. At the conclusion of your treatment, you will be aware of exactly what is required in order to regain the full health which is rightfully yours. Most importantly Bio Energy therapists such as Marian will urge you to take back control and responsibility for your own life and health. This will lead to very significant sense of self-empowerment. It is recommended that Bioenergy Healing treatment is carried out over four consecutive days at first with each session lasting approximately one hour. Marian's treatments usually takes place on a one-to-one basis in a fully private and relaxed environment using a background of carefully chosen music that, through experience Marian has found to enhance the treatment. Based upon past experience Marian is coscious that very often a sick or distressed child can obsorb stresses from the parent or guardian. It is wholly understandable for a carer of a sick child to be feeling stressed. When a parent or guardian contacts Marian in relation to an ailment, sickness or discomfort that a child may have in most cases Marian recommends that she works on both the child and parent - most usually the mother. Past treatments have proven that once the parents' energy is balanced very often the same will happen to the child with the resultant healing of both. While the bioenergy healing treatment is going on it is not unusual for a child to fall asleep. In addition to the conditions outlined above Reiki can be used to therapeutically deal with many another conditions. Contact Marian now to to discuss any particular difficulties that you may be experiencing. I have suffered with anxiety for the past couple of months and, after trying many different approaches without much success, a friend suggested that I try bioenergy healing. After my first session I was amazed at the improvement I felt. It was the only thing that was successful in alleviating my problems and I only wish I had found Marian sooner. I now feel that I'm on the road to recovery and have felt more positive and content in myself than I have in a long time. I would like to thank Marian for being such a kind and generous person and for making me feel so welcome and relaxed. I would recommend her to anybody. The word Reiki is made of two Japanese words - Rei which means "God's Wisdom or the Higher Power" and Ki which is "life force energy". So Reiki is actually "spiritually guided life force energy". A treatment feels like a wonderful glowing radiance that flows through and around you. Reiki treats the whole person including body, emotions, mind and spirit creating many beneficial effects that include relaxation and feelings of peace, security and well-being. Many have reported miraculous results. Marion provides hospital-standard food intolerance testing in her local clinics. She can test for a wide range of up to 150 individual foods. For more details please see Food Intolerance Testing Roscommon.